Fr Dennis has now left St Paul’s Agbozume for a new three year posting in Morocco which is in the Anglican Diocese of Europe. He was selected from a number of candidates. Bishop Matthias is delighted as he feels Fr Dennis’ particular skills will be of great use. There is much interfaith work amongst the poor and refugees there. See below for the latest news on our links with Ho. Click here for details of our Summer Serenade Concert on 12th September – our latest fund raising venture. 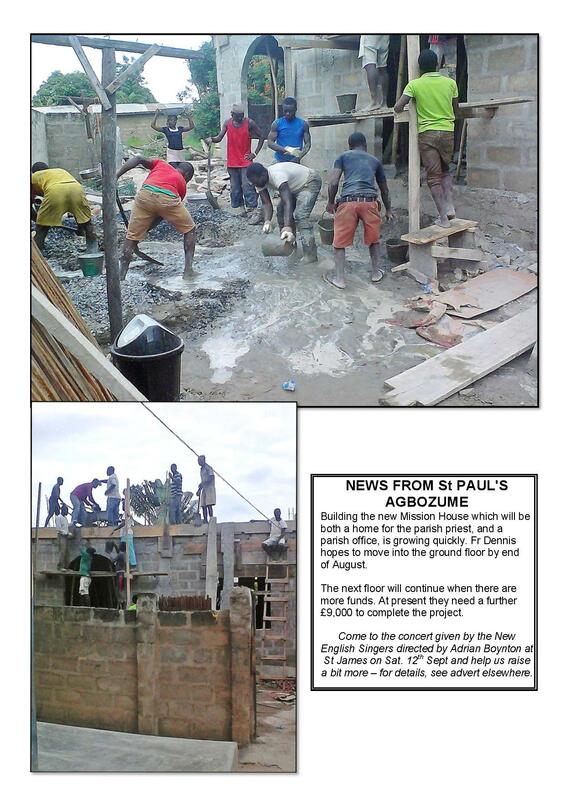 Please click here for an update on money raised for Ho so far in 2014. Our annual plant sale, held at the end of May 2014, organised by Andrea Kingston raised £186.41 for Ho. Our fundraising event “A Gig for Ghana” held on 16th March 2014, raised a fabulous £552. Please click here for a full account of the event. 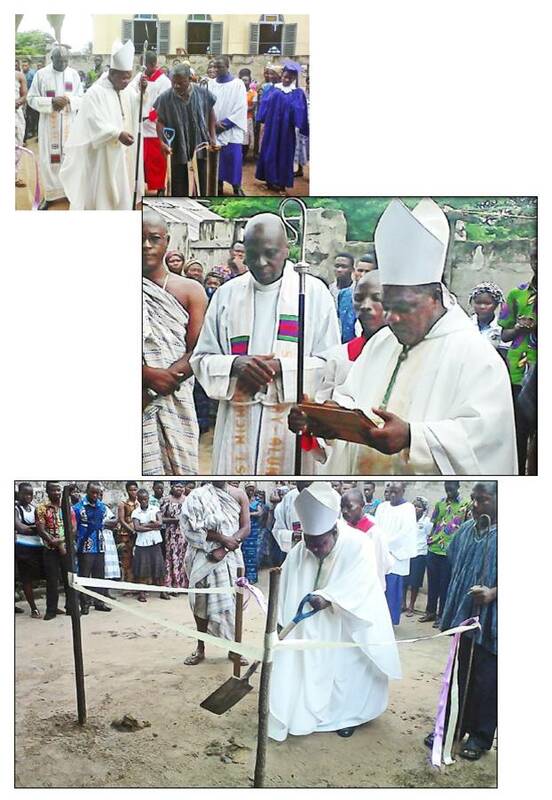 After a chance meeting at the Shrine of Our Lady at Walsingham in 2010, St. James the Great has formed a friendship with the people of the Diocese of Ho in the Volta region of Ghana.The Bishop of Ho, Bishop Matthias, first came and preached at our church in August 2010. 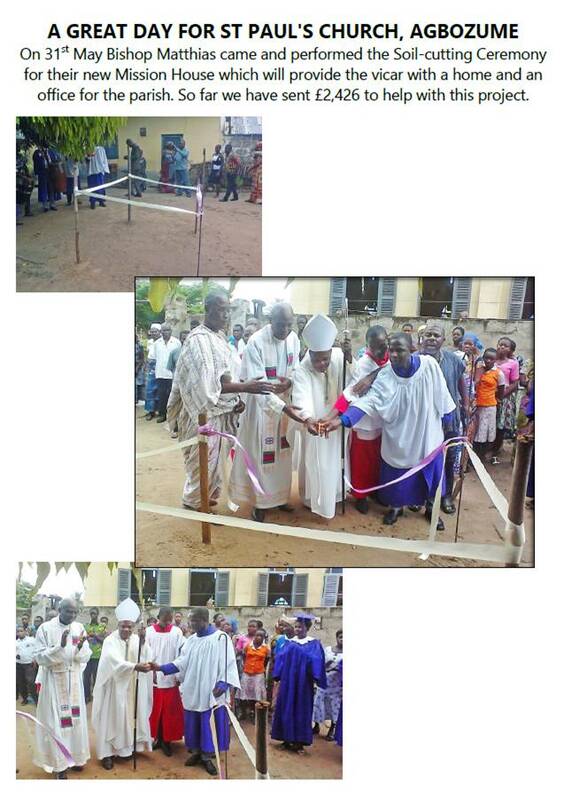 At the time many members of the congregation were moved by learning of how this geographically large area was developing and a group of us began to focus on the development of a two way link between our church and the area. Since then several links have been forged. 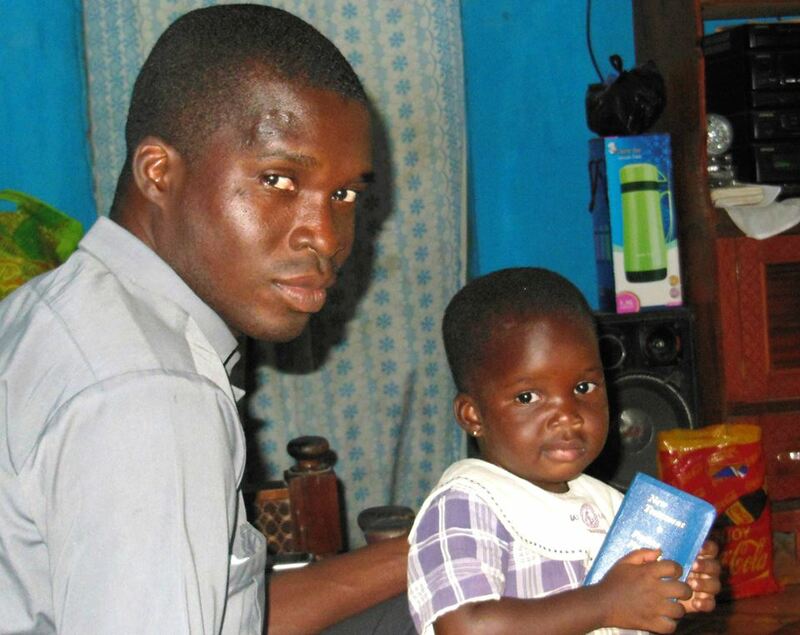 In January 2012 a fundraising event – “A Restaurant in your Village Hall” – was held and the following month a small group from our church travelled to Ghana to visit Bishop Matthias and to see how we can link with and support their needs. In addition several other fundraising events have taken place including a plant sale and a sponsored slim! Members of St James visited Ho in 2012 and the ladies have the costume to prove it! 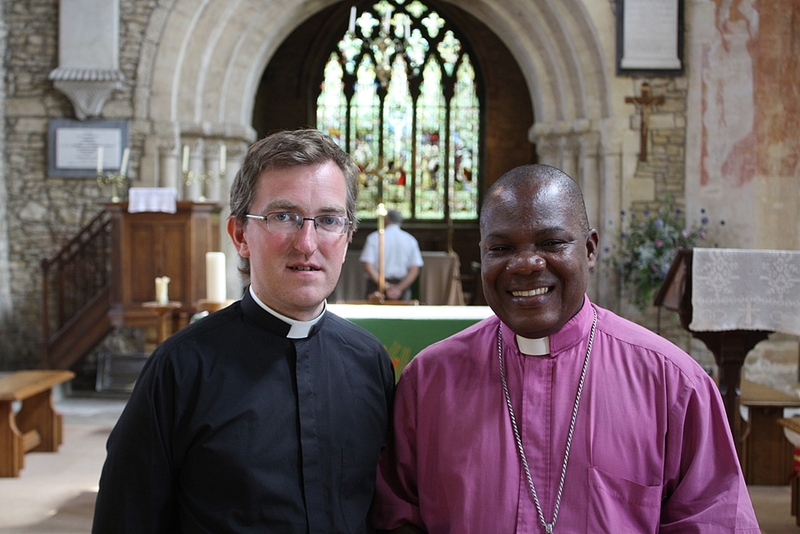 In July 2012 Bishop Matthias and his wife came to Britain and joined us for Mass at both Castlethorpe and Hanslope further deepening the relationship. We plan to continue to develop this link and both learn from and support our brethren in Ghana. 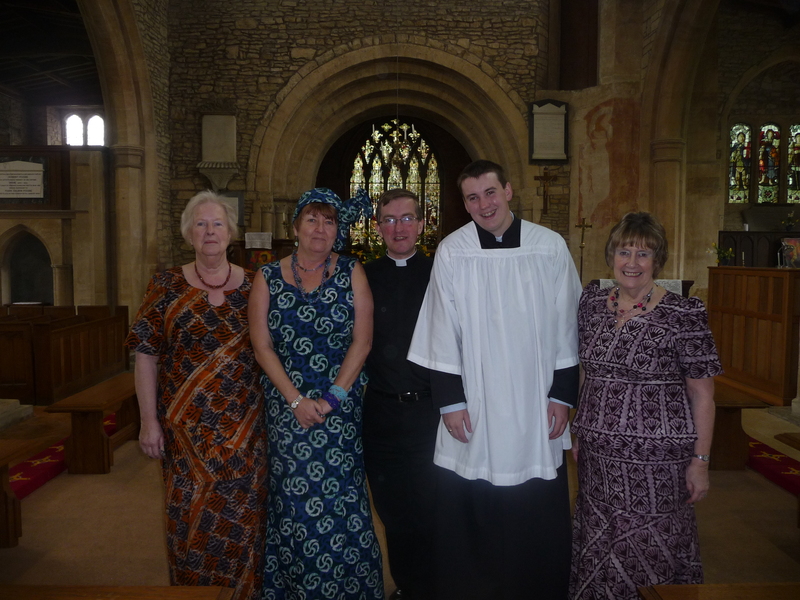 We hope soon to form a partnership with the Parish of St Paul’s Agbozume. Hanslope will be remembered each time the Bishop has a G&T! 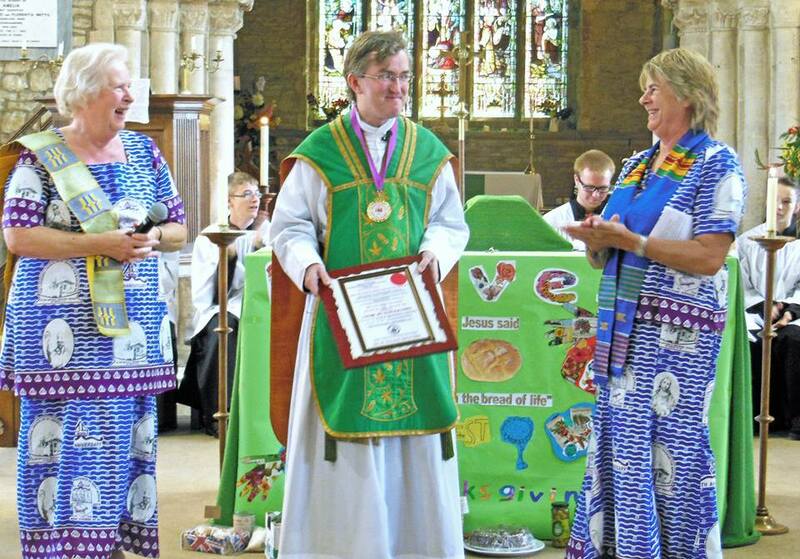 Towards the end of September Mary and Chuff flew out at the invitation of Bishop Matthias to join the 10th anniversary celebrations of the founding of this Anglican Diocese and of the Bishop’s own consecration. They met up with other Ho friends in the UK, from Newbury, Oxford and Portsmouth. 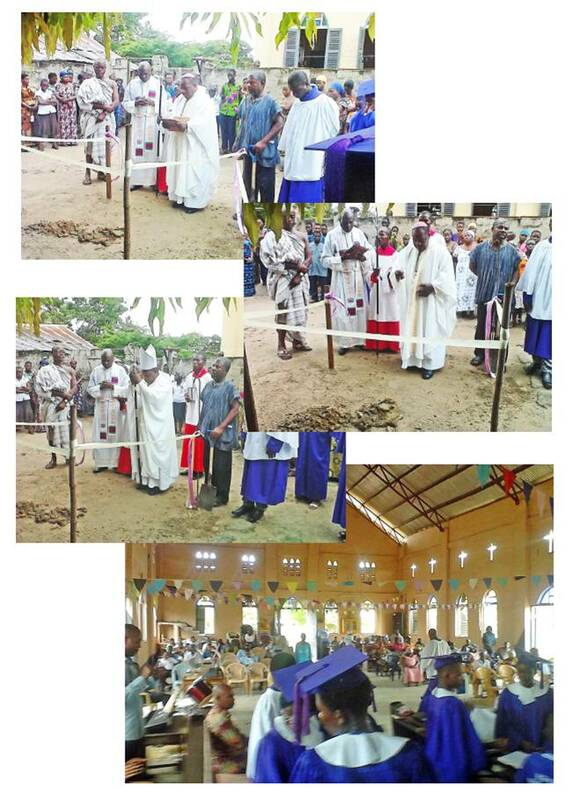 Mary: my first four days were in the south east in the parish of St Paul’s Agbozume with whom St James Church is developing a personal link. I presented a travelling communion set to the churchwardens for their vicar, Fr Prosper, to use when visiting the sick on his motor bike, the most useful form of transport around his large parish. I then had fascinating talks with their PCC, Sunday school, Mothers Union, Church Choir, Church Band, the Church Youth Group and the staff of St Paul’s School (which is next to the church). We shared an enormous amount of information and ideas which we hope will lead to closer links and friendships. More details as this progresses. Back in Ho we were fitted for traditional dresses by Celestine, a local dress-maker in uniquely designed fabric for the occasion. On Saturday we made a moving visit to the women in Ho’s prison with gifts of food and other essentials. During the afternoon representatives from all ten parishes in the diocese arrived and camped in school classrooms, in the Cathedral compound. That night there was a quiz when youngsters from the parishes competed against each other. Their knowledge of the Bible and their diocese was remarkable. Chuff: before joining Mary in Ho I had a few days on a friend’s fruit farm, called Blue Skies, north of Accra, where they grow pineapple, mango, papaya and coconuts. They have a huge processing plant where they employ 2,000 Ghanaians in a happy family atmosphere. They make delicious juices for sale locally, and export tons of packaged fruit, flown out four times a week for sale in supermarkets in the UK and Europe. All their waste is recycled into compost and returned to the farms. I then travelled across the beautiful countryside past Lake Volta, to Ho. On Sunday the wonderful church service lasted almost 7 hours starting at 9.00am with a cheerful procession of choir, clergy and lay people! It was all held outside with hundreds of people sitting under brightly coloured canopies. There was fantastic music and singing from a large choir to a band, and drumming and dancing from the younger members. 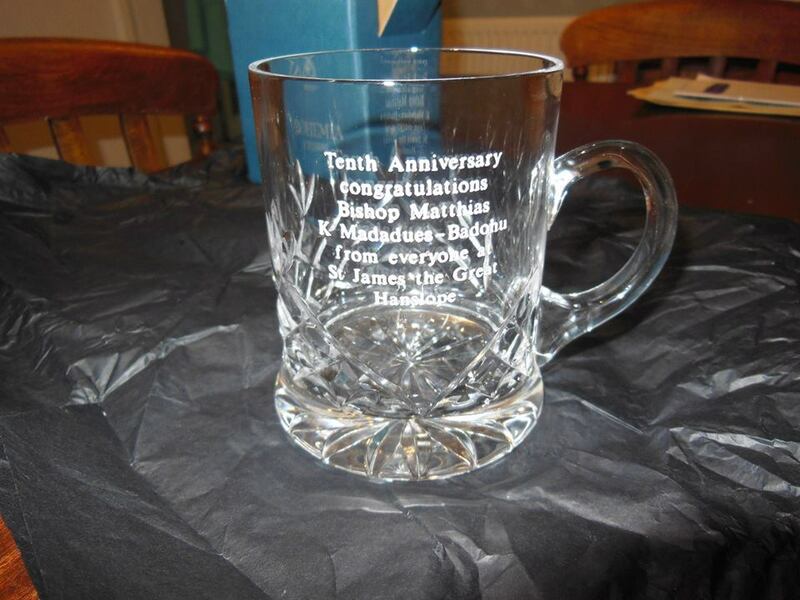 Presentations of awards were made to those who had contributed to the life of the diocese in the past ten years. We were asked to bring home an award for Fr Gary. The last day was spent touring the hills and more remote villages of the area before driving back to Accra – an incredible experience. We found Ghana a very safe and welcoming country. Our memories filled with a kaleidoscope of sights, sounds, smells and wonderful friendships. As the season of Christmas is here again, we thank God for granting us the privilege to see this joyful time once more. On behalf of the assistant curate, the wardens, P. C. C. and the entire church, I wish to express our warmest greetings to our brothers and sisters at St. James the Great. Christmas is an occasion of joy, love, friendship and reunion of oneself and God. 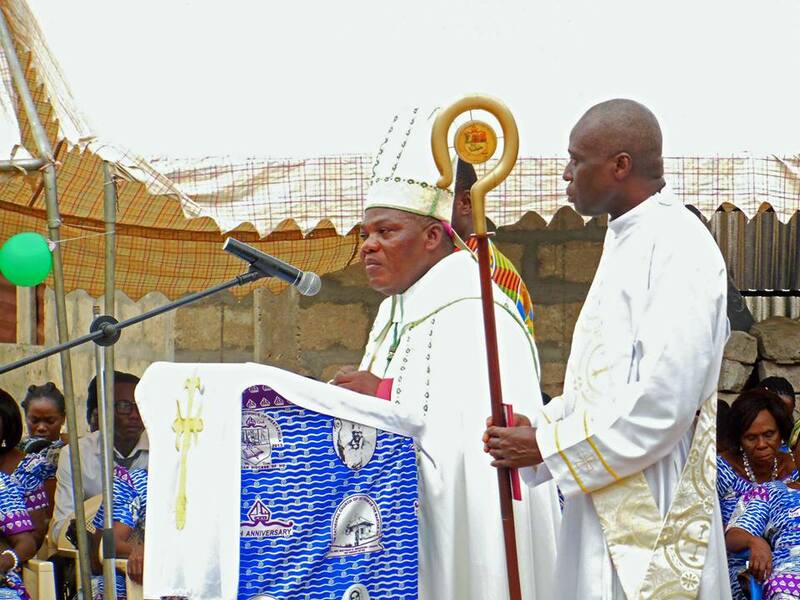 At St. Paul’s, Agbozume Christmas is a time of reconciliation, reunion and joy. Parents and children, families, clans and communities prepare towards this season. First, those far away from home due to jobs make time to visit home for family reunion and gathering. Second, those for a very long time have not been to church do their best to be in church on Christmas Day. Others usually tease them by saying “if not at all, at least once in a year”. Third, special meals are prepared by every home to celebrate the day. These are shared among all and sundry in the community. This shows love, unity and togetherness. As a church, we come together on Boxing Day to the church compound to share meals, drinks, and games such as football, volleyball, and cards among others are played that day to entertain ourselves. As we celebrate Christmas here at St. Paul’s, we wish our brothers and sisters at St. James the Great a very merry Christmas.